Sent on behalf of the Royal Forestry Society. 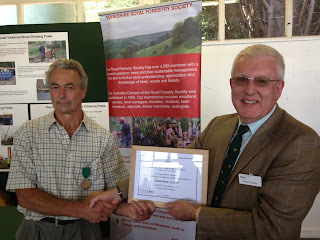 Caption: Jonathon Lester (left) receives his award from the Royal Forestry Society Yorkshire Division chairman David Carter. Chevin Forest Park head forester, Jonathon Lester, has received an award from the Royal Forestry Society (RFS) in recognition of 42 years of excellence in woodland management. Jonathon, 59, from Weston Crescent, Otley, joined the Leeds City Council's parks department forestry team as an apprentice in 1971 and by 1985 had been promoted to head forester at Chevin Forest Park, which achieved a Centre of Excellence award in 1994. More recently, under Jonathon’s stewardship, Chevin Forest Park has secured Green Flag awards in 2011, 2012 and 2013. The park was designated as a Local Nature Reserve in 1989 in recognition of its wealth of wildlife, including the green hairstreak butterfly and woodcock. The award was presented to Jonathon by RFS Yorkshire Division Chairman David Carter. "The specialist knowledge of foresters like Jonathon is vital to ensure that woodlands are well managed and thrive now and for future generations. Chevin Forest Park is a fine example of how Leeds City Council is using good woodland management to develop woodlands that benefit the local community and the local wildlife. Woodlands that are not managed effectively can quickly loose their integrity and become overgrown and ultimately are of less value for wildlife and the production of timber." "I would like to congratulate Jonathon on his Royal Forestry Society Award. Jonathon is one of our longest serving members of parks staff and is a credit to the council and his profession. Jonathon continues to do an excellent job at Chevin Forrest Park ensuring the woodlands are well kept for the local community to enjoy."